Experience the AZ fall & Bag a Peak! Ash Creek has the most incredible fall colors! 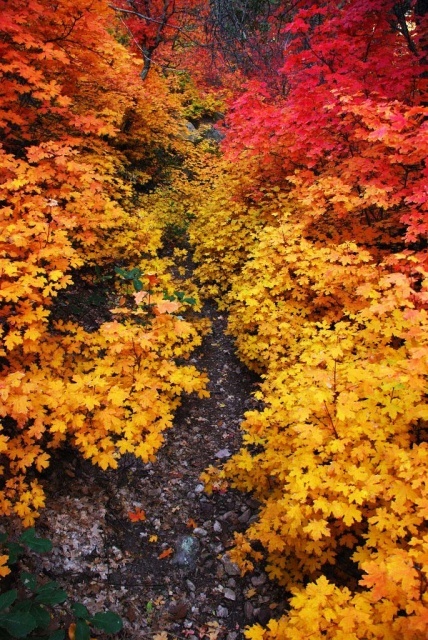 So How about a campout to experience fall color and bag Bassett Peak. Basset Peak from TH is a 12 mile RT with 2650 ft eleveation gain -- anticipating 6-8hrs on the trail. With the short days of fall -- it will be an early departure. Option for those that want to enjoy some stunning fall color at an easy pace: 1st 3 miles is mosltly flat and has great fall color. We will camp some where in the vicinity ..... Plan is for dispersed camping along the road to TH. Hope to catch you there! Life is but a dream ...there is no end to what you can dream! Somebody said Bassett Peak??? I'm in. Drive is probably 5 hrs or so -- if you are just doing the 3 miles you can come up Saturday as well. The drive is 5-6 hours from Phoenix depending on which way you go and how fast you drive the dirt road. Nice area, wish i'd seen it better when I did Bassett Peak but I was covered in the snow and clouds for that hike. I'd like to do the whole thing but don't know if I am capable since I am still trying to get past the moderate hiker/beginner backpacker stage. Otherwise, I'll keep Oliverr99 company. Desertgirl, thanks for referencing my pics! For those on the fence, you should really go. The objective that time of year is not the peak, so you don't need to stress about having to climb for a few thousand feet. The color show ends at the start of the real climb anyway. You can easily spend a whole day hiking only to the aspen stand (I forget how far it is, maybe 2 miles?) and back, taking pictures of the incredible colors the whole time. There is plenty of camping there too. It's a beautiful area. I'd say that I wish I was going to be there, but I have a New England autumn to look forward to this year. Thanks for the guidance here. I know you and several others have come back with unbelieveable photos and you know how I love to take photos . I will be curious to hear your impression of the New England fall vs this. At least for us, however, we get to come back to Phoenix and enjoy wondeful weather wtihout the white stuff to follow, ha! I know that you will really enjoy the hike if you go! 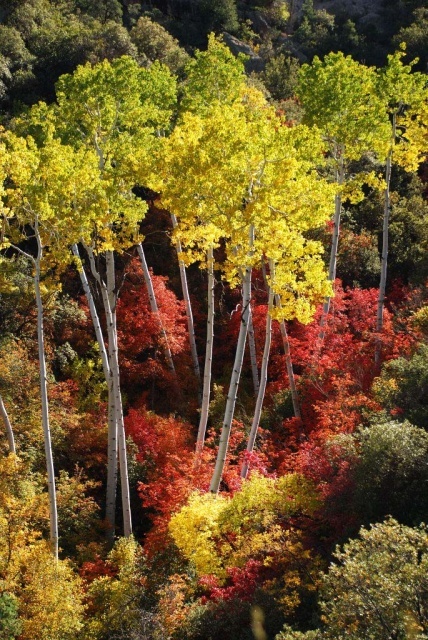 I'd rather spend a weekend seeing the autumn colors there, than anywhere in Flagstaff or the White Mtns. I think you'll all be jealous of the autumn images that I'll create this year, but you're right, I'll be stuck in the snow. Honestly, I am really looking forward to it! I love snowboarding and snowshoeing and I'll learn to telemark ski and cross-country ski. The backcountry opportunities for winter sports are endless here. I thoroughly enjoyed this past winter in Ohio, but I have a feeling I'm going to have a lot more fun here in New Hampshire. I know what you're all thinking... "You can have it!" That's fine with me! I spent most of October 2008 in New Hampshire - it's tough to beat. You will love it! I will probably be in the area only earlier by a weekend or so. Ambika I will be happy to look for large campsites if needed and give a road update. PSA---if ya go off trail for the photos look out for the poison ivy. There is lots of it in places trailside and off trail. About 2.8 miles one way to Aspen Grove. I would love to go on the short hike and camp. I am not sure I am in good enough shape to climb that peak! I'm interested... just need to see what happens with me, as usual. Hopefully one of the planned hikes I'll be able to make... Just seems lately things don't seem to be working out for me. This is one of my favorite hikes and I will make it up there at least once before this event. I never want to pass up an opportunity to do it with a group. If anyone needs transportation from Willcox to the end of the dirt road where you can begin the hike, just get in touch with me.